Sign painting has long been practiced by professionals who understand the importance of arranging prioritized copy effectively and assigning color values expertly. 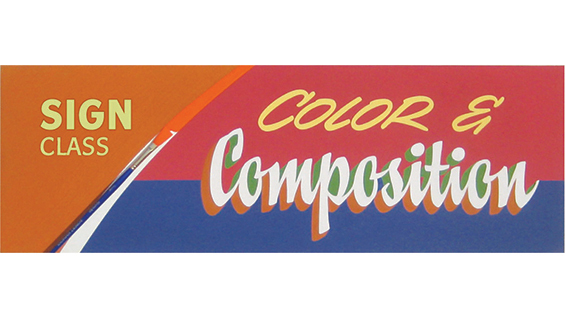 This workshop will cover several of the most accepted approaches to laying out lettering and making it work chromatically. Among the topics covered will be color theory, basic color combinations, and terminology. Also taught, will be the fundamental considerations for arranging compositional elements for dynamic effect. Students will be urged to explore various aspects of elementary sign design and color value selection for the sake of utilizing high, medium, and low contrast, as ways of elegantly expressing a clear graphic message. Meets Saturday and Sunday: 10:00 a.m. - 5:00 p.m. The final day to register is Feb. 2nd., students enrolling after this date will pay a $15 late fee.